Hello again my lovely readers!! 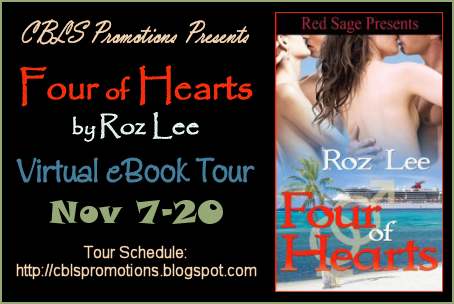 Today we have a guest post by Roz Lee and a sneak peak at her smoking new novel, Four of Hearts. Take it away Roz!! 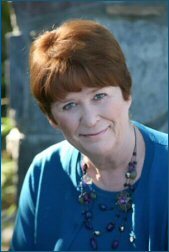 Call the Romance Police – I’ve Broken a Rule! Ryan and Candace Callahan are approaching the one-year anniversary of their marriage, and their friends, Richard and Fallon Wolfe aren’t far behind them. On the surface, it doesn’t sound as if there is anywhere for this story to go, not without someone dying, and as my editor will tell you, I have an aversion to killing people off on my little cruise ship paradise. (She suggested it, I said no. More than once.) So, how did I take two happily married couples and write a romance about them? Easy, I let them fall in love. Again. Still not convinced? What if I told you they fell in love with someone other than their current spouse? Sounds like a divorce waiting to happen, doesn’t it? Are those flashing lights outside, or is it my imagination? Definitely not Romance novel material. “Please Officer! I’m not guilty! Let me explain!” Okay, so that’s my little fantasy. Let’s get back to the explanation. Rest assured, no one is getting a divorce, though both couples go through some tense times as they try to reconcile what they feel, with what society expects. The story begins with Candace’s request for a very special and unique anniversary gift. (See the excerpt) Ryan, devoted husband that he is, is willing to give his wife anything, and sets out to do just that. With a little help from their friends, Richard and Fallon Wolfe, Ryan is able to give Candace exactly what she asked for, but the episode opens the way for the couples’ friendship to blossom into something much deeper, and much less accepted in society. Richard and Ryan are accustomed to society’s disapproval, but when the nasty insinuations begin to fly about their wives, the men go into protective mode, nearly destroying the new relationship, as well as their marriages, in the process. Cue the women to take charge and set things right. Isn’t that the way it works in real life – the women are the ones who pick up the broken pieces and glue it back together? FOUR OF HEARTS is a story about forbidden love and people who are willing to risk everything to follow their hearts. Read it with an open heart and an open mind, and know that the human heart has an infinite capacity for love. Well I for one, am totally interested in this book now :) Most people who have been on a cruise know that there is nothing more romantic, but it is also filled with endless possibilities! MUAHAHAHH!! Sorry, let me put the bad girl away so we can continue with this post :) But I totally agree that women are the ones who put everything back together again once its been destroyed...what would they do without us? LOL!! 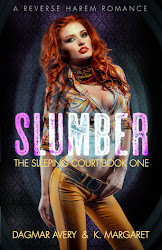 Here is that sneak peek I promised and a little bit more about our author! Roz and her husband have two grown daughters they couldn’t be more proud of, and are currently raising an eleven-year-old Labrador Retriever, Betty Boop, who isn’t aware of her canine heritage. 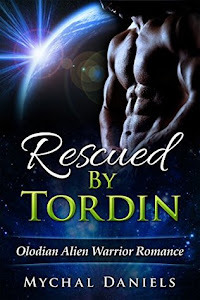 I would just like to say thank you to Roz for this great post and I am quite positive that many of my readers will be checking out this book!!! Her next stop on the tour (tomorrow) is at http://thephantomparagrapher.blogspot.com/. HAWT HAWT HAWT! Thanks for breaking the rules, Roz! @ Sharon - Thanks for stopping by! I think I'm getting better at breaking the rules, and enjoying every minute of it! @Vicki - I do my best! LOL I grew up breaking rules, to be sure. It's the way we Southern women roll! Thanks for stopping by. Sometimes it's better to break the rules than to break someone's heart. I do believe we can love more than one person in our lives--parents love all their children, even if they have more than one! One of my points, exactly, Chellesie. Many widowed and divorced people find a second love. It is only society that says we must love in a linear fashion - one after the other.